You opened a playlist QR-link from the BabySleepSweet App.To see the general description and overview of the BabySleepSweet App please follow this link. If you want to see additional information related to a video - please use the QR code displayed on the video. This Playlist (PL) is hosted on YouTube and contains several YouTube videos. 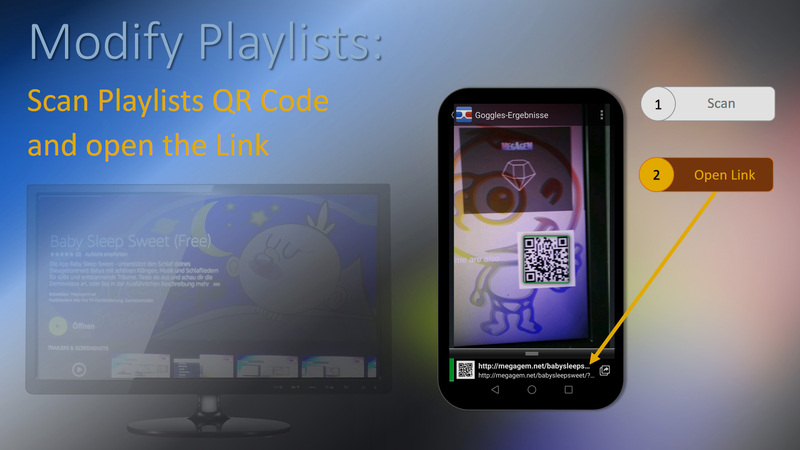 You can open the playlist on other devices if you follow this link or enter the following URL (https://www.youtube.com/playlist?list=PLHeWEpTFcvE89W7QBuB8-eH2OiEx5-9Ha'). The Playlist contains videos from 3rd party artists. 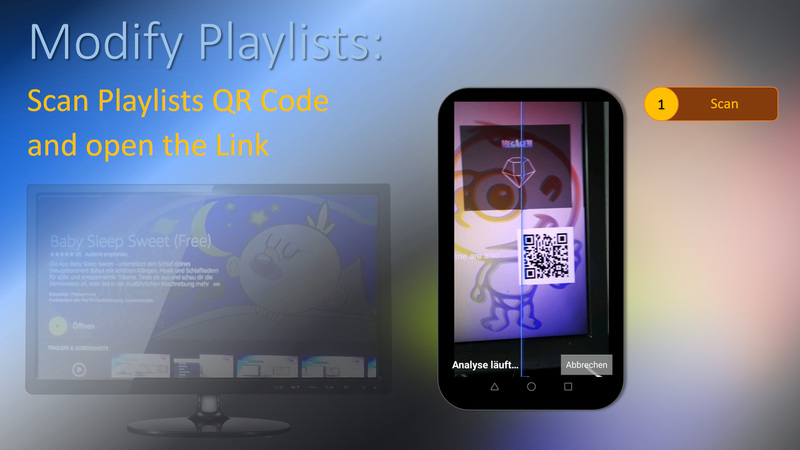 For video credits scan the related video QR code or find the video yourself in the playlist. Did you know? - You can add your own videos! 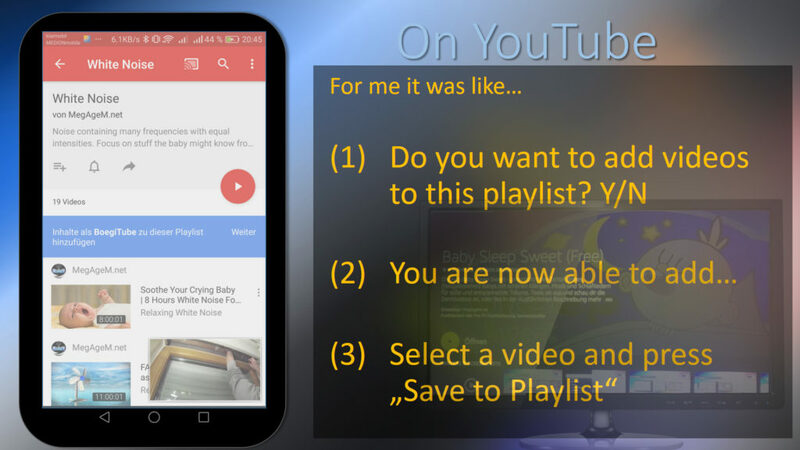 You can add videos to the playlist. Visible for you and all other users of the App. See the Tab [Add Videos to Playlist] for more information. You can add more videos to Other Sounds - Playlist if you follow this link. How does it work? 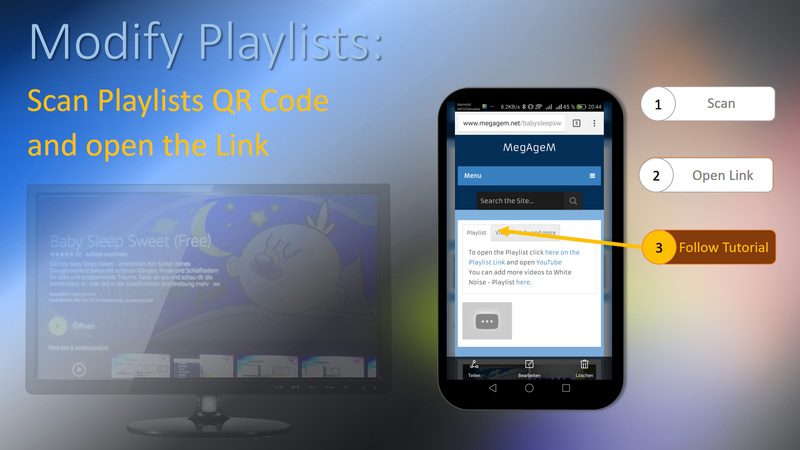 The link will open your YouTube account and you get the right to add videos to the playlist. This looks different on different devices. I tried to make some screenshots for you, but probably it will look different on your device. Phasellus quis mauris. Integer eu justo. Fusce tortor enim, elementum ut, auctor non, accumsan quis, enim. Aenean posuere ante id odio. Nulla facilisi. Donec ac eros quis ipsum auctor blandit. Cras eleifend libero fringilla turpis. Integer sem. Curabitur commodo dapibus lacus. If you want to contact me (the app developer) then feel free to use the contact form. If you mention the video ID in your message (App-babysleepsweet-Video-PLHeWEpTFcvE89W7QBuB8-eH2OiEx5-9Ha) I can answer and help you faster. No Function Button Donec ac eros quis ipsum auctor blandit. Cras eleifend libero fringilla turpis. Integer sem. Curabitur commodo dapibus lacus. Suspendisse ante ligula, adipiscing porta aliquam et, rutrum nec lectus. Baby Sleep Sweet – supports the sleep of your (newborn) baby with nice sounds, chilling videos, music and lullabies for sweet and relaxing dreams. Baby Sleep Sweet – supports the sleep of your (newborn) baby with nice sounds, music and lullabies for sweet and relaxing dreams. The sound on your TV has more depth and bass than other devices. These deep tones help your baby to relax. The App offers more than 20 different videos and music pieces in different categories. In “Sounds” you will find White Noise and other simple sounds your baby loves. Sounds like your hair dryer, a fan, sounds from a car ride and even sounds your baby knows from the womb / what you can hear inside the belly. The “Sound Mix” category contains tracks that mix light music and melodies mixed with other familiar sounds for your baby. “Classical music” not only appeases babies but also adults. The stimulating music is intended to promote relaxation, and it is also said that the intelligence and the mind of the child are encouraged. All audio tracks are displayed with nice videos and / or visual effects. 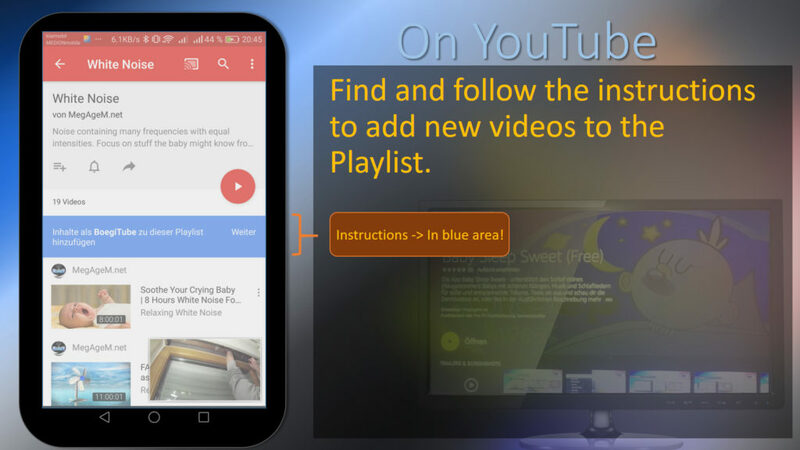 The videos are organized in YouTube Playlists and you can easily choose them yourself. A User Playlist holds your and other user’s best choices to calm your baby’s. Important: This app is designed to help you and your baby to relax. Take the chance to create a deep and relaxed atmosphere. Discover the joy your little miracle child has for you. This app is not meant to be a Babysitter. The BabySleepSweet App is a first practical usecase for the DigitalLotus TV template we created for the Amazon FireTV. We created a new QR System to link the TV content with additional information on mobile devices. I promised to provide my biographical info’s for quite some time. However, I still have this dummy text in my bio area since I prefer coding and technical hacks and hate writing information and things nobody really reads and needs. BTW. Yes... I'm the best programmer in the world ;-) and tons of experience.